The fact that it’s November is completely blowing my mind, you guys. All of a sudden I’m in full Thanksgiving AND Christmas planning mode with lists and notes and recipes scattered everywhere. It’s a madhouse in my brain and I suppose it’s not going to calm down until January. Just in time for all those healthy recipes, right? But why save the ‘health’ for later when you can have an awesome, indulgent-tasting meal right now? I’m going to post my Thanksgiving round-up soon, but, first, another recipe to add to the mix–acorn squash stuffed with super autumny goodness! 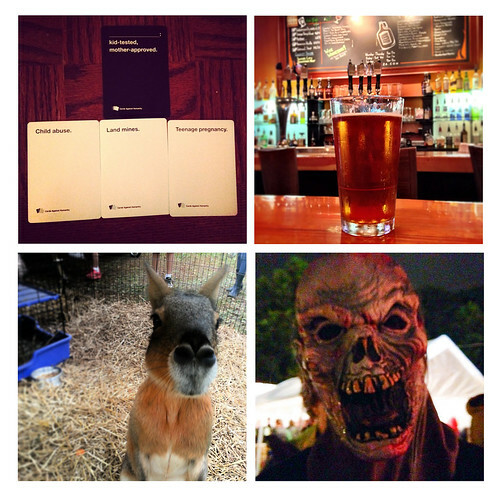 Over the course of the weekend, we hit up as many festivals, wineries, and breweries as we could all while still relaxing and having a good time. 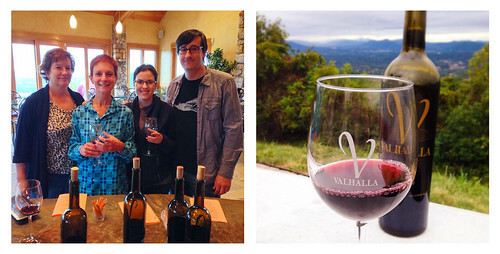 Maybe my favorite part of their visit was the first full day when G begged me off work early to head up to Valhalla Vineyard for a happy hour of sorts. I can’t get enough of the view up there (it’s on a mountain’s edge overlooking the Roanoke valley) and the wine is really darn good to boot. Definitely a must-visit for anyone visiting town. To cap off a very fun weekend, I knew I wanted to serve up a warm, inviting Sunday supper of sorts that celebrated all of fall’s harvest. We’d stopped at the farmers market the day before and picked up some acorn squash, purple potatoes, and hen of the woods mushrooms among other things and I knew I wanted to showcase the mushrooms as well as the squash. Thus a very Thanksgiving-ish stuffed squash was born–one that incorporated kamut (super grain! ), hen of the woods, garden harvested oven dried tomatoes, carrots, and dried chiles from G’s sister’s garden. With a little date balsamic vinegar drizzled on top and roasted purple potatoes on the side, it made the perfect main dish to celebrate their visit. And it’d make the perfect centerpiece of any Thanksgiving table. Add the pre-soaked kamut to a pot and cover completely with water. Add 1 tsp salt and bring to a boil. Lower to a simmer and cook 45 minutes or until tender. Drain water and set aside. 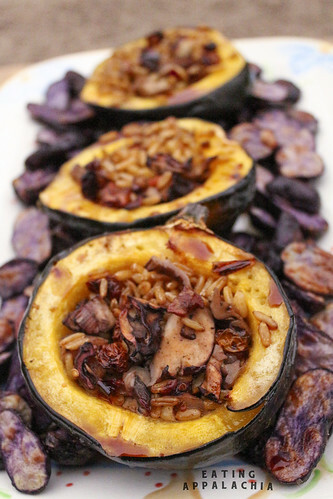 Drizzle olive oil on the acorn squash halves and place, carved side up, in a baking dish. Roast for 20 minutes, then remove from oven to stuff. Toss the fingerling potatoes with a pinch of salt and black pepper in just enough olive oil to coat. Transfer to a baking sheet, lay in a single layer, and roast 20-30 minutes, until tender when poked with a fork. Remove from oven and set aside. In a large skillet, warm 1 tsp olive oil over medium heat. Add the onion and carrots and cook until translucent, 5-7 minutes. Add the garlic and cook until fragrant, 30 seconds. Add the sundried tomatoes and mushrooms and cook until the mushrooms begin to release their juices and brown (5 minutes). Add salt, pepper, sage thyme, and a pinch of chili flakes and adjust seasonings to taste (remember you’re mixing with the kamut so a little extra salt isn’t a bad thing). Mix in the kamut. Fill the half-roasted squash with the mixture and place back in the oven to roast another 15-20 minutes. Once the squash is tender when poked with a fork, remove from oven. Drizzle with balsamic vinegar and serve with the potatoes. Gorgeous gorgeous gorgeous! I’ve never been a huge fan of acorn squash but this could change my mind. It’s never had a great filling imo. The purple potatoes are a nice touch too. I think you mean you laughed TOTALLY appropriately! Or maybe instead of crying? This stuffed squash sounds so great & super-hearty! Somehow I haven’t had squash at all yet this fall–must fix that ASAP. Ugh, don’t even mention Christmas to me… I’m still struggling with the whole concept of autumn! Of course, seasonal produce does help me warm to the seasonal shift. Those squash are just my speed. I’ve actually never cooked with whole kamut, so I’d love to give it a try in such a promising dish. Hi Jes, just wanted to tell you I really like the way you write about you live your life and your food. I live in Italy and everytime I read your posts it’s like taking a trip to the U.S. Thanks! That looks amazing, Jes! I love kamut. This sounds so unusual and GOOD. Love the sound of the sundried tomatoes. Gorgeous pictures, as always.